Healthy eating is not just a mantra these days, it is a way of life. People, who are conscious of a sustainable future, are moving away from the lure of a decadent cheesy pizza to something more wholesome and nutritious - like something straight out of the soil in their own backyard. Going to backtofarm.com is a deliberate choice now. 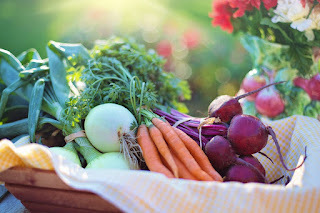 The reasons for growing your own garden could be many - from enjoying the crispness of your lettuce and awareness of less food wastage to more organic reasons like being close to nature and losing the fear of pesticide poisoning. As more and more people turn to their own backyards for producing their own food, it is important to keep in mind that success is attainable if a fair dose of enthusiasm could be combined with the right amount of expertise. Sunlight is important for growth of plants but so is protection from strong winds and frost. If there is lack of space, make use of raised beds and pots of various sizes. Sometimes containers can also be used but make sure they have proper drainage and depth. Loosen the soil and spread it, preferably with a rake. Make sure to take out any rocks or lumps. Next, mix some good fertilizer like compost or manure. Compost is easy to make and is extremely good for your garden. Make sure to give a few days for the compost to break down once it is added to the soil. Sometimes, despite our best intentions, plants don’t grow well. Factors like weather, insects or lack of pollination could have an adverse effect. Proper planning is necessary. Growing a single crop in a big area will attract insects, so it is better to mix up the produce. At times, taller plants not only offer shade from direct sunlight for smaller plants, they also act as support for climbers too. A lot of people start with tomatoes and peppers, which can both be grown in pots if you get the right variety. Zucchini are easy to grow, but they take up a lot of space, so be mindful of how much room you have. It is a well-known fact that plants should be watered in the morning. The reason for that is, mornings are cooler and hence provide enough time for plants to soak up the water needed. However, the same reason does not work for plants at night. At night they could retain the wet soil for a long period and could hence suffer from fungal infections. If you have a garden, you will have weeds. There is no escape from it unless you take precautions to pull them out as soon as they appear. Covering the soil with mulch also helps to control them to some extent. Insects can be the bane for your garden. Organic sprays like garlic and pepper sprays could help. Some people also hand-pick the bugs off and drop them in soapy water. Growing your own vegetable garden is a sure way of improving eating habits. It will surely take some time and effort learning what works in your yard, but it is worth it! Market-bought vegetables are no match against the taste or goodness of home-grown veggies. Plus, you will be so proud when you see those first little sprouts coming up. Have you ever attempted to grow a vegetable garden?